We humans have the ability to memorize a lot of information. Every day, every minute, we see things, we hear sounds, and we remember them. We remember the colour of the car we passed on the way to the grocery store, a nice deep red, we remember the smell of the chocolate cake in the house, so much so that it becomes possible to describe it, we remember the name of the couple met in Tahiti in the backpacker’s place and with whom we exchanged the few pieces of dark chocolate we had, but for some reason, we (I namely) forget what we (because you do too, don’t you?) need to do to use the TV remote control, and hence have to ask every single time. In a few words, there are things we remember very well without forcing it, and others we cannot register and remember, even if we have learned them thousands of times. Odd, no? As to food, I have an enormous powerful memory. I should not be surprised – and I am not really – , but still I find it fascinating all the same. How come I can remember the dish I had 10 years ago in that little restaurant by the sea when I forget every single time how to use that damn remote control? Do you suffer from the same disease? Hence if I do not know how to use the 5 remote controls we have at home (although I am told they have been consolidated in one), at least I have the ability to improvise and created dishes thanks to my visual memory of them, or from pictures seen in real life or in books. Really what is more important? Use a remote control or make a meal, I am asking you! All right, maybe both. Still, those improvised dishes become my art work and study projects. I play with them, I take notes and I test until I am happy with the result. Creating and reproducing. Aren’t we part of the world that keeps repeating itself anyhow? In other words, we are just parrots and perpetuate the cycles created before us. Too complex for a Monday after Easter, I will acknowledge, yet I simply wanted to give you the background of the recipe I made today. 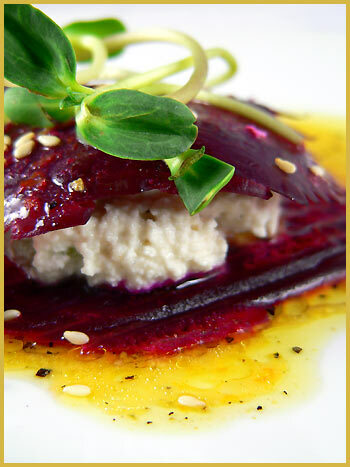 Hope you are not tired of beetroots, are you? Because I am going to praise beets once more. I am glad to see that I am not alone in the beetroot praise: Matt talks about them. Maybe this is good therapy to convince anyone who does not like beetroots that this vegetable is good for you. Forget about the inconvenience of dirty hands while preparing them. This root vegetable, with carrots, is a favorite in my kitchen. Had I not grown up running around in my mum’s garden and my aunts’, picking those vegetables and eating them, I might sing a different song today. But as a true country girl, I developed a strong attachment to beets. This recipe is not complex. This recipe is for all. This recipe..do you want it? Start by cooking the beetroot until tender (with skin) (in the oven in foil paper or in boiling water). When you can run a knife blade through, the beetroot is cooked (depending on how large they are, the cooking time varies). Let cool and peel the skin. With the help of a good knife or a mandoline, make nice thin slices in the beetroot. Take the ricotta and drain the water. Peel the cucumber and remove the seeds. Cut in tiny cubes. Mix together the ricotta, the cucumber, the mustard seeds, the cherry vinegar and add salt and pepper to taste. 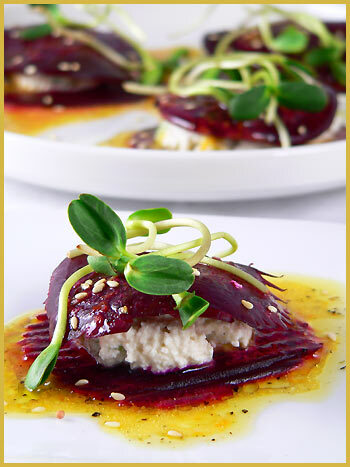 Take appetizer plates and in the middle, place a slice of beetroot. Put some ricotta preparation on top (with a decoration bag). Add another slice of beetroot. Decorate with watercress and a few dry-fried sesame seeds. To make the vinaigrette, beat together the orange juice, with the mustard and olive oil, starting by mustard, orange juice and then adding the olive oil. Beat until it is foamy. Pour some vinaigrette on top and eat without waiting. Beautiful photograph! You are very talented. Does it take you long to style your food before you take your pictures? What a beautiful post! And how right you are … memory is so selective for all of us. I think we rembember most what we want to remember most and like you … for me it is so much about food. What a glorious colour … I shall remember this beetroot for that alone! And thank you for sharing the recipe … so generous! J’addore le betteraves…. he he.. pour moi tous ça! mama mia Bea, quand tu dors tu imagine toujours la cuisine. As debbie, it takes time to arrange your food for photography! What a creativity.. I am used to your blog already, but still new things everytime i come. Bravo! Just gorgeous! I nearly “passed it by”. But it looks 100% more complicated than it is – the recipe is VERY doable! Thanks for the inspiration! I couldn’t agree more with you about memory. Sadly, I’m much better at remembering how to use the converter than what I ate for dinner ten years ago. I do, however, keep a journal when we go on trips, so I always have a permanent reference. Your dish is beautiful — I especially love the little pool of vinaigrette. J’ai fait le dessert au chocolat blanc et framboises hier, quel délice ! Et maintenant une autre symphonie en rouge et blanc, qu’il me faudra essayer aussi… Merci pour toute cette inspiration! un délice ta recette, je suis certaine de me régaler. et j’ai oublié, tes photos sont très belles. Oh how I love beets. What a great combination with the Ricotta. I’m definitely writing this one down.. thanks! Funny, I just roasted two lovely beets just today! I will make this recipe this week…..thanks Bea! J’adore les betteraves! Good idea and your photo is fabulous as usual! You are so talented!! The easter eggs are gorgeous too!! toujours aussi magnifique, recettes comme photos! Debbie, thanks a lot. In answer to your question, t depends on the dish. Sometimes if I have little ideas, it takes more time, but usually, I know what kind of shots I want. Relly, ahahh, yes I always dream about food 😉 seriously, I do, not always but I really do! Alanna, yes you are right, very easy. Sometimes what looks complex is really down-to-earth and it is great like this. Rob, ah yes don’t you want to dip your crust of bread in this vinaigrette? Liza, super. Je suis super contente que le dessert t’a plu! Moi aussi je l’ai refait dimanche! Fabienne, yes having a vegetable garden is a real treasure! Love love it. Melissa, great, I hope you will like it! Riana, Merci bien. Btw, have been trying to leave comments on your blog, but unsuccessfully! ;-( Not sure why! Thanks for your lovely note. And of course I do not mind the mention. I will go right now and read it! As to being my neighbour, that would be with great pleasure as I love to feed my friends! You can feed me with your nice stories!! je passerais bien des heures sur votre blog, mais les partiels qui approchent m’en empechent ! j’aime beaucoup votre blog, les photos sont vraiment ma-gni-fiques ! Wow, that looks absolutely delicious, Béa. We’re going to have to try it soon!